"....Where Insomnia Hits the Ice." As was the case last night, this rendition of "Hockey After Dark" will be somewhat abbreviated because my family had a long night, and I'm sitting down to write this after 1 AM. ...I can't even begin to tell you how excited I am about this. Seriously. 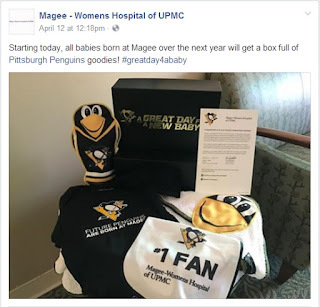 Amazing thank you to Magee Women's Hospital in Oakland and, of course, the Pittsburgh Penguins for combining forces for something that's going to be incredible memorabilia for our family. We had our first daughter, Alexandria, at Magee and we couldn't have been more pleased with our care. But this time? WE. GET. SWAG. I absolutely **PROMISE** to share pictures of NAME_STILL_UNKNOWN_01 in her Penguins regalia at the very first feasible opportunity! Speaking of our daughter's unknown-as-of-yet name...we actually spent Saturday night at a "Baby Bracket Bonanza" held in our honor. The "BBB" premise is simple: think "March Madness," only with potential baby names. As such, our friends created four different themed brackets full of potential girl names, and we voted on each matchup to choose a "winner" (first name) and runner-up (middle name). At the end of the night, the name "Rogue" (she of X-Men/Heroines Bracket) emerged victorious, narrowly beating out "Bernice" (she of the "Old Time Names" bracket), so, according to our friends, our second daughter should be named "Rogue Bernice Traeger." Now, aren't you glad that you did? I haven't laughed that hard in a long, long, LONG time. Probably since I first saw Glozell. Is you okay, is you good cause I wan know. But okay, after the BBB, we watched the hockey game. 1) Braden Holtby continues to be really bad. Ed Wood bad. "North" bad. "Transformers 2" bad. The official Capitals company line may be that they benched him to "shake things up," but really, Goldberg from the Mighty Ducks would have stopped 2 of the 3 early Penguins goals. 2) Alexander Ovechkin has clearly lost a step in terms of skating, and driving. His shot is still remarkable and terrifying, but he's not driving play from the perimeters with the frequency or success that he enjoyed in the past. 3) The Capitals are still fixated on taking shot attempts regardless of the defenders standing in front of them. The problem with deflected/blocked shots from players at the perimeter is that those pucks tend to go in the opposite direction, with the Penguins in possession. 4) The Penguins are making their hay on odd-man advantages (usually born out of a defensive block or deflected shot attempt by the Capitals). The resulting odd-man break in favor of the Penguins is yielding one excellent scoring attempt, whether by the third player initiating a second drive, or the puck carrier doing so, thus freeing up a spot on the ice for the third available recipient. Regardless of the execution, the Penguins are finding themselves with Grade A scoring opportunities, and they are converting on them. 5) The Capitals are stubbornly trying to generate their office from the perimeter into the slot instead of going behind the net and forcing the defense to collapse, thus freeing up the point men (including Ovechkin) as being able to receive a pass for a shot attempt within his established wheelhouse (left circle). I love writing this article each night, and I love the interaction I'm able to share with all of you via on Facebook or on Twitter. If you don't already follow me at @DXTRAEGER, you absolutely should. Thanks for reading, and like I said, I will keep our daughter updates coming. I think it was probably the wrong move to pull Holtby, imho. Goal #1 was kinda soft, but it was a breakaway! Shattenkirk really botched that sequence. Goal #2 was an excellent shot. Goal 3 was bad, Holtby didn't cut off the shooting angle and there was way too much net. Still, their best chance is with BH in net, not Grubauer. Not that it much mattered, we're still winning that game regardless. But it was a panic move, and a little sad to see quite honestly. The Caps are a super worthy opponent and it must be absolutely brutal to be a Caps fan most years. BTW, the rookie record for playoff goals scored is Dino Ciccarelli with 14. Name what team he did it with, Traeg!! If it was Dino's rookie team, it has to be the Stars, no? I feel like he played in Minnesota, Washington...Detroit?...and then Minnesota again. Did I miss any? You got it, nice job! Minnesota North Stars in 1981. I kinda thought Claude Lemieux had the record, so I googled. He only had 10. Guentzel is already at 7, which is pretty nuts. He's got a legit chance if we keep going like this.